[18.8.59] Merging "Bank/Cash Transactions" tabs into "Receipts & Payments"
The latest version (18.8.59) brings a number of changes. Most notably the merger of Bank Transactions and Cash Transactions tab into a unified Receipts & Payments tab. This allows me to reduce some complexity within the codebase and remove unnecessary clutter and terminology from the user interface. I also think Bank Transactions and Cash Transactions tabs were a bit misleading about what they actually contain. You’d assume Bank Transactions tab should contain all bank transactions including inter-account transfers but these were in a separate tab and Bank Transactions only had Bank Receipts and Bank Payments. No inter-account transfers. The same applies to Cash Transactions. It just makes sense to call the tab what it actually contains - that is Receipts & Payments. You will also notice, button Receive Money has been renamed to New Receipt and Spend Money button has been renamed to New Payment. This is to make the button labelling consistent with the rest of the system where I never use verbs to name buttons. The button labels are always in the format New something. For example, when you go to Journal Entries tab, the button is called New Journal Entry. 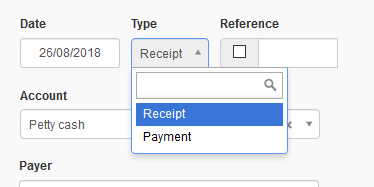 When you are in Receipts & Payments, the buttons are now New Receipt and New Payment. This is a bit of a dangerous change because everybody knows the difference between Receive Money and Spend Money but the difference between New Receipt and New Payment is less clear. In fact, I expect a lot of people making a mistake by recording income from customers as New Payment and expenses as New Receipt. That’s because when you pay a supplier, you might receive a receipt which might nudge you to click New Receipt button instead of New Payment. And that’s OK.
That’s because now it’s possible to easily switch transactions between receipts and payments. So even if a mistake is made, there is no need to delete the original receipt and re-enter it as a payment. Simply edit the receipt or payment and change the type. This is why clicking on the wrong button within Receipts & Payments tab is no longer a big deal. The mistake is very easy to fix. When merging Bank Transactions and Cash Transactions into a single tab, a new problem has arisen on how to reconcile automatic reference numbers under Cash Transactions tab with manual referencing under Bank Transactions. And if you need them automatically generated, tick the checkbox. By default, the checkbox will be unchecked so if you decide to use automatic reference numbers, it is a good idea to check the box under Form Defaults so the box is automatically checked when creating a new receipt or payment. I think I will be rolling this mechanism across all tabs. A lot of people find reference numbers unnecessary so this way everyone can decide whether to use them or not. Conversions between cash accounts and bank accounts can now be done without loss of information. When bank accounts are converted into cash accounts, the status of any pending deposits and withdrawals will be lost, because cash transactions are assumed to clear immediately. An account itself can be reconverted, but pending status will not be restored. Also, custom fields from the converted account will not carry over, because custom fields are unique to a form type. This no longer applies to the latest version. Custom fields will be retained and the pending status will be preserved (in case you decide to “reconvert” back to a bank account). In previous versions, Cash Summary was a report summarizing all transactions under Bank Transactions and Cash Transactions tabs. It wasn’t completely obvious due to the terminology used. I think the new approach is more straightforward. Receipts & Payments Summary report summarizes all receipts & payments under the Receipts & Payments tab. This is much more obvious. Currently what I did to bank transaction via import feature before the changes being made to manager tabs to receipt and payment, I defined my own running sequence number since the bank statement does not provide it. with the merged both cash account and bank account, my greatest fear is the sequence number of cash transaction which I usually prefer it to be sequential set by manager but both using different sequential number. Which Sequential Number Manager will continue to automate? cash, bank or recent sequential number created in manager where it will over ride the last before recent entry created? Receipts and payments to all cash and bank accounts will be handled in a single sequence. If some transactions come from unnumbered bank transactions and others from numbered cash transactions, any receipt or payment, regardless of the type or account, will be automatically numbered based on the highest number found (by adding 1). If you don’t want that to happen, don’t check the box. Existing reference numbers will not be overridden. While I am keen to have a look at the upgrade version 18.8.59 but the cloud version still seems stuck at version 18.8.20. It makes me wonder, if there is any reason for this not to release the upgrade for cloud version? @lubos @Tut, may I have some idea when to expect the upgrade for CLOUD VERSION ? Current desktop edition version is already 18.8.71. If the cloud edition is still frozen, that is because bugs are being worked out related to major changes. Personally, though, I thought the cloud edition was unfrozen at 18.8.59. I have no information about development schedules. I am a forum moderator, not the developer. @Tut, Tks for your response. I have no information about development schedules. I am a forum moderator, not the developer. I understand what you calrified. May be @lubos will let us know (cloud users) when to expect the update and and, any reason for keeping back update of the cloud version? Why when i print receipt to show what is cash or bank as before ? Because in the new scheme, all receipts or payments use the same form. Previously, they were different types of transactions; now they are they same. You may not be aware of it, depending on how long you’ve been using Manager, but distinct labeling of bank and cash transactions was only added 6 months ago in February 2018, because users did not know where to find a particular transaction. Now, they are all in one place. You are correct. But you can disable automatic numbering if you don’t like it and enter separate manual sequences for both. These are now two variations of the same form, one that moves money across the boundary of the business. Think about your own bank. It most likely does not assign different sequences of numbers to deposits and withdrawals. It just generates a confirmation number (possibly by some mysterious algorithm) for whatever transaction you make. Please help me, after updated merge between cash and bank account I get the problem that my financial supervisor can’t to see the transaction that input by financial staff in receipt and payment tab in order to my supervisor get the problem to check that transactions (input by financial staaf in other username). HOW? Then, my financial supervisor has the restricted user and she can’t search the transaction that she inputed before. but when I change his user into unlimited access, she can find her transaction, HOW? I think it’s still good when informed in payment slip which one bank or cash. @ejjaadiargo this was a bug. The latest version (18.8.80) should show all receipts & payments restricted user has access to. I want to applaud the changes. Now the distinction between Bank and Cash accounts is more definite and clearer for me. A Bank account facilitates batch entries from a download of transaction data. A Bank account encourages batch entries and discourages individual entries. Because if you go to Bank Accounts >> Statement Balance (for any Bank Account), you have a button to import bank statement. You can still make individual entries through the Receipts & Payments tab. A Cash account does not provide for automatic entry. If you go to Cash Accounts >> Balance (for any Cash Account) you do not get an import button, but do get New Receipt and New Payment button. Another way of looking at the difference is that the Bank Accounts are oriented around Bank Statements; Cash Accounts are oriented around not getting statements, therefore, nothing to reconcile. I think that separating into two kinds of accounts (as you have done) will encourage consistency of transaction entry. Manager Accounting is getting even easier and faster to use. I notice that, after you had upgraded the version and when i do the import transaction from bank statement, the reference number that i want it to import was not working like before. Is there any setting need to preset or from now on, the reference number need to enter manually after the process of import has done?